Riverton Aquanauts head coach Gemma Herrington with the team. THE Riverton Aquanauts Swimming Club took out Round 1 of the Swimming WA Summer Series at the weekend, putting it in pole position to win the series final in December. 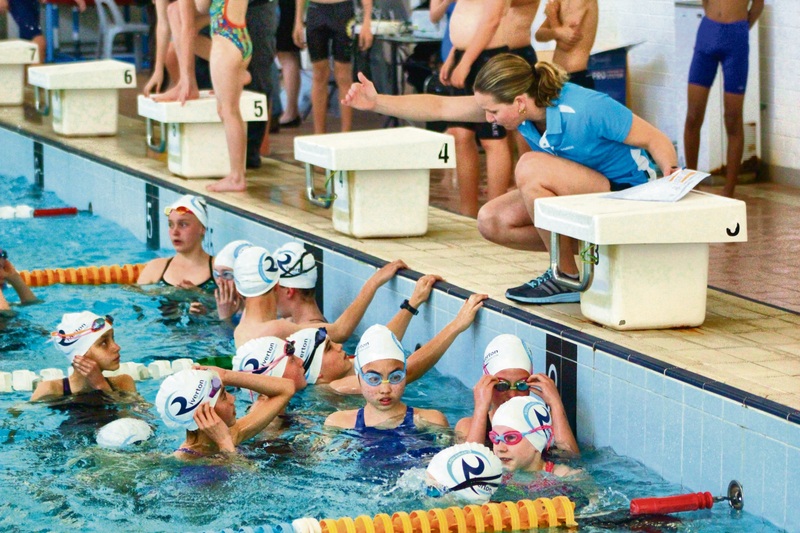 The series consists of three mini swimming carnivals for 16 metro swimming clubs, split into competitions held in the Metro North, South West and South East regions. The top two clubs from each of these regions will then progress to the finals in December. Competing against Thornlie, Lesmurdie Legends and Swan Hills Swimming Clubs, Riverton dominated in the pool, with team of 28 achieving personal bests. Club vice president Rick Golding said it was a great result. “It was an afternoon full of fun, cheering and team spirit as our club battled it out to become a legend of the league, with lots of friendly rivalry taking off on the day,” he said. “I am incredibly delighted to see the 28 swimmers achieve numerous personal best times on the day. Head coach Gemma Herrington echoed the sentiment and said it was an excellent placing for the first round of the series. “We are very excited to be leading after the first round, but we have two more rounds to go and will need to compete strongly against the other local clubs in order to progress to the finals,” she said. The club welcomes any swimmer interested in competing and making friends at its next club night on November 4.